Extron Electronics has introduced the ACP Series of configurable audio control panels that interface directly with the DMP 128 Plus audio processors. Four models in the series provide volume adjustments for mixing and zone control, plus preset or macro recall for room configuration. Multiple ACP Series control panels can be installed around a meeting space and linked together. Each panel can be used for independent control of a specific area or to adjust audio settings for the entire combined space. The ACP Series is ideal for use in applications that require a simple and cost-effective means to control basic audio functions. Used with or without a control system, the ACP Series button panels are easy to configure using Extron DSP Configurator Software. "The ACP Series button panels make it easy to deploy basic volume control and input selection for the DMP 128 Plus audio processor," says Casey Hall, Vice President of Sales and Marketing for Extron. "They are ideal for presentation and conferencing applications in boardrooms, courtrooms, and conference centers." Four models are available: The two-gang ACP 100 features six dual-colored backlit buttons for easy operation in low-light environments with a volume knob for smooth, precise volume adjustments. 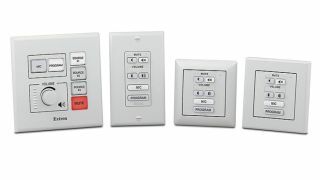 Three additional models feature six customizable, backlit soft-touch buttons: The one-gang ACP 106 D Decora wallplate, the one-gang ACP 106 MK for MK boxes and enclosures used in the UK, Middle East, Singapore and other regions using MK-type enclosures, and the one-gang ACP 106 EU compatible with Flex55 modules, mounting kits, and enclosures, as well as EU junction boxes.